I enjoy reading a good exciting historical epic so I thought I would read The Gates Of Rome, the first novel in the Emperor series, written by Conn Iggulden. It introduces two young Romans: Gaius (Gaius Julius Caesar), son of a senator and born of noble-blood, and blood-friend Marcus (Marcus Junius Brutus), son of a high-class courtesan (Servilia) who grow up as close as brothers, and form a deep and long-lasting friendship. as they face the harsh realities of life in Ancient Rome. The novel follows their progress As they begin their careers (Gaius as a senator and Brutus as a legionary). Marcus is trained alongside Gaius by a famous, retired and unbeaten gladiator named Renius. In preparation for a life in the legions serving the Republic, Renius teaches them not only swordsmanship, but also how to become weapons themselves. However At the end of their training, Renius seriously wounds Gaius in a training accident; in retaliation Marcus proves his skill with a sword, severely injuring Renius’s arm. Marcus gains a position in a legion guarding the Roman province of Macedon. After leaving with Renius ( Marcus begins to make a name for himself in the Fourth Macedonia Legion’s centuria:”gaining the nickname “Bronze Fist”. Meanwhile, in Rome, Gaius accompanies Marius on his Triumph before being confirmed as a Senator in his own right. Marius confronts Sulla in a Senate vote by sending him and his legion, Second Alaudae off to Greece to put down a rebellion led by the Greek king: Mithridates (known as the Second Mithridatic War). Gaius also makes a reputation for himself as a serious party-goer, and takes his father’s name as his own: Gaius Julius Caesar. In Greece Sulla confronts Mithridates. Meanwhile Julius falls in love with Cornelia, daughter of the wealthy and influential Senator Cinna, and marries her on the morning of Sulla’s return. Trouble erupts when Sulla tries to take Rome but Marius refuses to give up Rome and surrender his legion to Sulla, ordering his men to burn Rome. Meanwhile The remnants of Primigenia under Orso Ferito and Bar Gallenius, fights a losing battle against Sulla’s army and Julius is captured in the chaos. Marius’ wife frees Alexandria. Sulla is declared Dictator of Rome by the Senate and the Assembly of the People, and is given total control of the city and republic of Rome, except for Hispania (which Marius’s general Quintus Sertorius had established as an independent state). Sulla immediately begins taking vengeance on all of Marius’ allies, including Marius’s beloved Primigenia legion who are branded traitors by order of Sulla. Marius and his supporter’s holdings are seized and Rome burns. Julius is brought before the victorious dictator, and Sulla gives him an ultimatum, Julius refuses and is exiled from the city. Julius signs on with a naval legion where he finds his childhood nemesis Suetonius and swears to return once he is able to avenge his uncle. Marcus meanwhile impresses with his abilities on the battlefield And is promoted to the rank of Centurion taking the name Marcus Brutus. American rock musician, multi-instrumentalist, and singer-songwriter Dave Grohl was born 14 January, 1969. Currently the lead vocalist, guitarist, and primary songwriter for Foo Fighters, He was also the former drummer for Nirvana and Scream, and is also the current drummer for Them Crooked Vultures. His musical career started At the age of seventeen, when he auditioned with local DC band Scream & was asked to join. Grohl dropped out of high school & Over the next four years, Grohl toured extensively with the band, and they recording a couple of live albums. Grohl also penned and sang vocals on the song “Gods Look Down”. Grohl became a fan of Melvins and eventually befriended the band. During a 1990 tour The Melvins’ Buzz Osborne took a couple of his friends, Kurt Cobain and Krist Novoselic, to see the band. A few months later, Scream disbanded. Grohl called Osborne for advice, and the latter gave Grohl’s phone number to Krist Novoselic, who invited Grohl to Seattle. Grohl subsequently auditioned for Nirvana, and soon joined them full-time. At the time that Grohl joined Nirvana, the band had already recorded several demos for the follow-up to their debut album Bleach, They signed with DGC Records and entered the studio to record the album. 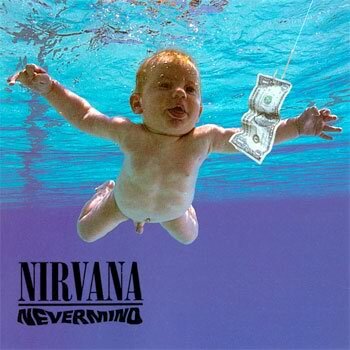 Upon its release, NEVERMIND exceeded all expectations & , catapulted the band to worldwide stardom with songs like “Smells Like Teen Spirit”. Grohl had been writing songs for several years, but declined to introduce them to the band for fear of damaging the band’s chemistry. Instead, Grohl compiled his songs and recorded them himself, releasing a cassette called Pocketwatch in 1992 on indie label Simple Machines. Grohl released the cassette under the pseudonym “Late!”. In the later years of Nirvana, Grohl’s songwriting contributions increased, Cobain overheard him working on a song called “Color Pictures of a Marigold”, and the two ended up working on it, the band released this version as a b-side on the “Heart-Shaped Box” single, titled simply “Marigold”. Grohl contributed the main guitar riff for “Scentless Apprentice”and the band recorded a demo of a song later named “You Know You’re Right” which was the band’s final studio recording. Following Cobain’s untimely death in April 1994, Grohl retreated, unsure of where to go and what to do with himself. He recorded a fifteen-track demo. He briefly considered drumming for other bands andl took a brief turn with Tom Petty and the Heartbreakers. Petty asked him to join permanently, but Grohl realized that his future lay elsewhere, and declined the invitation. Grohl’s name was also rumored as a possible replacement for Pearl Jam drummer Dave Abbruzzese, and Grohl even performed with the band for a song or two at three shows during Pearl Jam’s March 1995 Australian tour. However, by then, Pearl Jam had already settled on ex- Red Hot Chili Peppers drummer, Jack Irons, and Grohl had other solo plans in the works. Grohl then made a Demo tape which created considerable major label interest. However he did not want the effort to be considered the start of a solo career so he recruited other band members: former Germs and touring Nirvana guitarist Pat Smear, and two members of the band Sunny Day Real Estate, William Goldsmith (drums) and Nate Mendel (bass). Rather than re-record the album, Grohl’s demo was given a professional mix and was released in July 1995 as Foo Fighters’ debut album. After touring for more than a year, Grohl returned home and began work on the soundtrack to the 1997 movie Touch. Grohl performed all of the instruments and vocals himself, save for vocals from Veruca Salt singer Louise Post on the title track, and vocals and guitar by X’s John Doe on “This Loving Thing (Lynn’s Song)”. In the midst of the initial sessions for Foo Fighters’ second album, tension emerged between Grohl and Goldsmith. After which Goldsmith officially announced his departure from the band. The band’s second album, The Colour and the Shape, was released in 1997 containing “Everlong“, “My Hero“, and “Monkey Wrench“. Foo Fighters’s sixth studio album Echoes, Silence, Patience & Grace was released on September 25, 2007. and spawned three singles “The Pretender”, “Long Road to Ruin” and “Let It Die”. In 2009 Foo Fighters released their first Greatest Hits collection, consisting of 16 tracks plus a previously unreleased acoustic version of “Everlong” and two new tracks “Wheels” and “Word Forward” . The Foo Fighters’ latest studio album, Wasting Light, was released in 2011, containing the single “Walk”. Grohl has also written all the music for his short-lived side projects Late! and Probot as well as being involved with Queens of the Stone Age. Furthermore, he has performed session work for a variety of musicians, including Garbage, Killing Joke, Nine Inch Nails, The Prodigy, Slash, Juliette Lewis, Tenacious D and Lemmy Kilmister (Motorhead). Foo Fighters latest album Sonic Highways was released in 2015. MarvinParanoidAndroid-rich_7652During his career Rickman has also played comedic roles, sending up classically trained British actors who take on “lesser roles” as the character Sir Alexander Dane/Dr. Lazarus in the science fiction parody Galaxy Quest (1999), portraying the angel Metatron, the voice of God, in Dogma (also 1999), appearing as Emma Thompson’s foolish husband Harry in Love Actually (2003), providing the voice of Marvin the Paranoid Android in The Hitchhiker’s Guide to the Galaxy (2005), and the egotistical, Nobel Prize-winning father in Nobel Son (2007). He was nominated for an Emmy for his work as Dr. Alfred Blalock in HBO’s Something the Lord Made (2004) and also starred in the films Snow Cake (2006), with Sigourney Weaver and Carrie-Anne Moss, and Perfume: The Story of a Murderer. He also appeared as the evil Judge Turpin in the critically acclaimed Sweeney Todd: The Demon Barber of Fleet Street (2007) directed by Tim Burton, alongside Harry Potter co-stars Helena Bonham Carter and Timothy Spall. Rickman also appeared as Absolem the Caterpillar in Burton’s film Alice in Wonderland (2010).